There is no question rapid response and effective source containment can help to dramatically reduce both the size and the cost of a mold loss. I know because mold invaded our home. I was very glad the insurance company sent restoration professionals to help us with our problem. Not only were they the face of compassion during a very stressful time, they taught me some basics about how to address this kind of problem. First, mold is present because water is present. You have to fix the water problem. Second, mold should not be disturbed. Disturbed mold spews tens of thousands of spores into your air, contaminating your home. Third, mold can be toxic for humans and pets. Those with sensitivity or allergies to mold are vulnerable, especially the elderly and infants. Finally, a mold problem can be very expensive averaging between $10,000 and $30,000 per claim. Personal costs may rise because of mold limits on insurance, deductibles, temporary living expenses, and property losses. Later on, expect increased insurance premiums. While standard mold protocols (contain, remediate, restore) should be followed, it is a good idea to approach a mold problem much like you would a medical emergency. For cuts, you stop the bleeding by putting a bandage on it. For a bee sting, be prepared to use an epipen if you are severely allergic. With a bad virus, the patient is quarantined. Quarantining is what area containment is about. You seal off the mold- infected room using plastic sheeting so mold cannot escape and contaminate the rest of your home. Another approach would be to use source containment that puts the focus on encapsulating or sealing mold to the surface it grows on. This makes great sense because it prevents mold from becoming airborne in the first place. There are three methods used for source containment: poly-film and tape; sticky-back carpet protectors and tape; and newer “wet” technology tapes. The poly-film method, sort of “bags” the mold to its host surface. Mold can still fly off the wall but it is in the bag. This method requires two people to apply, uses readily available materials but can be easily compromised during remediation. The carpet protector method uses “sticky pads” designed to protect your flooring from construction activities. These pads use acrylic adhesives that require a dry, clean surface to be effective. They had been used primarily because no “wet” technology was available. They tend to fall off the mold surfaces and have to be taped to adjacent surfaces to work. Application often requires two people. During remediation they can easily be compromised, releasing mold. The newer “wet” technology method uses specially designed tapes or crack-n- peel bandages with engineered adhesives that stick to wet surfaces. They are applied directly to mold. This method is easy to apply, requires only one person, and causes minimal disturbance. During application, whatever mold that is disturbed, is sealed into the adhesive-laden barrier. It is trapped like a fly on flypaper and prevents further contamination. This method is highly effective, very difficult to compromise, and is already becoming a part of standard mold protocol for some companies. 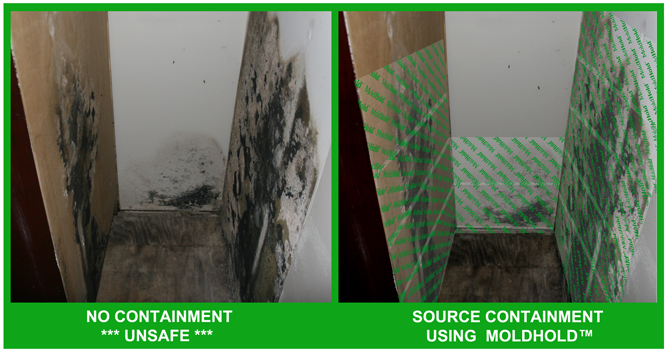 How does rapid response and source containment lessen a mold loss? Rapid response means there is less time for mold to grow, propagate and contaminate your home. Source containment or encapsulation means that until remediation (cleaning and removing affected property) mold is locked in place. With effective source containment, workers can clean and dry the area without worrying about disturbing the mold and making a larger mess. Less mess translates into lower costs. Less airborne mold makes your family safer. Also, it lessens the chance your family will have to find temporary shelter, lowering displacement costs. Bringing down remediation and restoration costs means your insurance company and you will have a smaller out-of-pocket cost. A smaller loss now, could minimize higher insurance premiums later. Our restoration company, using industry software, compared what we spent versus a rapid response and source containment scenario. The estimated savings was fifty-five percent on labor and displacement. Adding in our increased cost of insurance premiums, the total savings exceeded ten thousand dollars. Obviously, nobody wants to hear the words “you’ve got mold” but every year, many thousands of household find they have high humidity, leaky faucets, damp basements, broken washer lines, roof leaks, cracked exterior walls, air conditioning system overflows and other plumbing issues. Anticipating the unexpected by keeping a few dollars worth source containment product on hand – is sound advise. Advanced planning, rapid response, and source containment will help your family keep a mold problem smaller and save you a bundle.